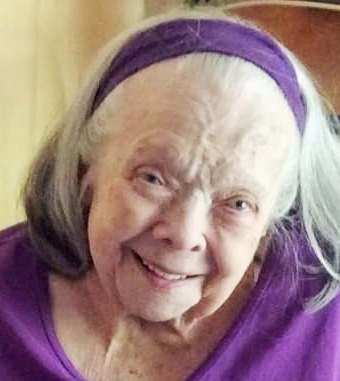 Dellasue L. Button, age 97 of Grand Haven, formerly of Wichita Falls, TX, passed away Wednesday, October 17, 2018 at a local care facility. She was born on March 29, 1921 to the late Wallace and Vivian (Kitch) Lape in Nappannee, IN. and married Bertrand Wesley Button on September 11, 1949 in South Bend, IN. He preceded her in death on December 16, 2004. Dellasue was a 72 year member of the Order of the Eastern Star, Lakeville, Indiana Chapter #479 and also was a member of the First United Methodist Church of Wichita Falls, TX. She was known as the “Choir Mother.” Dellasue loved painting and collecting china. She was very involved in her community and loved to help others. Dellasue very much enjoyed her time as a former leader for The Campfire Girls, and their program for younger girls, The Bluebird Program. Dellasue will be lovingly remembered by her daughter, Rebecca (Randy) DeYoung of Grand Haven; granddaughter, Kimberley Worrell; grandson, Kevin Mlinar; and many friends. She was preceded in death by her husband, Bertrand; and sister, Barbara Cissne. The Graveside Funeral Service will be at 3:00 p.m. on Wednesday, October 31, 2018 at Crestview Memorial Park in Wichita Falls, TX. Rev. Don Pellikan will be officiating. Memorial Contributions may be given to First United Methodist Church of Wichita Falls, TX.